This guide deals with electronic and ultrasonic mosquito repellers, advantages and disadvantages of using them. Which devices are the safest and which are the most effective? Have a look at a comparative chart to narrow your choice. Read about scientific studies in the field of ultrasound’s impact on mosquito behavior. Apart from that, you will find a brief overview of alternative methods to keep mosquitoes away. Traditionally, mosquito control is associated with spraying chemicals. Think about it: if these traditions were that good, the very process of warding off these bloodsuckers would be a pure joy. But it is not the case. Why? The reason is that insecticides, even the ones approved by the EPA, pose a potential risk to the health of people and their pets. Manufacturers say that when applied according to the label, the chemicals like DEET will not be harmful. Sure, but the thing is that the label specifies many constraints: do not let your children apply the insecticides themselves, do not overapply the solution, etc. Even products based on natural ingredients, such as essential oils, have a number of limitations in their use: they are known to harm cats and are capable to cause an allergic reaction in people. 1 How Do Electronic & Ultrasonic Mosquito Repellers Work? 2 What Types Of Electronic Mosquito Repellers Are There? 6 What Alternative Methods Can Be Used In Mosquito Control? How Do Electronic & Ultrasonic Mosquito Repellers Work? All the above-mentioned is the reason for trying alternatives, with electronic and ultrasonic mosquito repellers being the best option for today. Why? While most chemicals cannot be used indoors, the bulk of electronic and ultrasonic repellents, to the contrary, are designed to be installed inside the house. And it is not that you have limited indoors options, although it is also the case. Electronic repellers are considered to be effective in dealing with a smaller number of mosquitoes while our homes typically are not packed with mosquitoes. In addition, there is such thing as the convenience. Many people have to deal with mosquitoes on a daily basis and one day they just get fed up with spraying, fogging and taking all related precautionary measures. And that is when electronic repeller appears like a magic wand: it will do your fighting and, unlike bug zappers, you will not even have to empty containers with dead insects. The device will just keep the pests away. Is Electronic Mosquito Repellent Effective? The question is whether they are really that effective. Ultrasonic mosquito repellers generate a high-frequency ultrasound that is supposed to keep these insects away. As far back as 2001, The Federal Trade Commission warned producers of ultrasonic repellers that they had to substantiate the claims about their products’ efficacy. Namely, manufacturers should provide scientific evidence that the devices work as advertised. So far, scientists fail to prove the effectiveness of ultrasonic repellers. To be precise, “no significant difference” was revealed, which is not the same thing as being entirely useless. This means that you cannot rely on this method alone but rather should use it as part of your pest integrated management strategy. If mosquito infestation is low, this “insignificant difference” may be quite tangible. There are models using insecticides as a repellent. Their difference from sprays and foggers lies in the way the chemicals are spread. The device emits it automatically and in smaller amounts in comparison with conventional methods of insecticidal applications. Now, let’s have a look at the difference between the types of electronic repellers. What Types Of Electronic Mosquito Repellers Are There? There are three main types of electronic mosquito repellers: ultrasonic devices, mobile apps, and units releasing insecticidal repellents. These devices can be either battery-powered or have to be plugged into a socket. We will start with the most effective ones under the brand name Thermacell and then, we will look at OFF! that is not so powerful. Finally, we will consider the Soaring ultrasonic repeller, the efficacy of which is still to be proved. Well, as promising as that sounds, it is insecticides the efficacy of which has been scientifically proven. And yet, electronic repellers can be more advantageous in that they allow you to avoid applying still harmful chemicals to the skin. Another powerful argument in favor of using these devices is that they spare you spending much time on spraying and fogging. Nor there is any need to take the related precautionary measures, something that is actually a very troublesome matter. Nor do you have to bother with storing the unit which, unlike bottles with liquids, is safer and can be easily taken on a trip. So what kind of options do we have? Perhaps the most well-known product on the market is that by Thermacell. This brand is trusted by professionals and has been tested by the Defense Department as well as used by the US Army. Let us start with a portable model, Thermacell MR-150, that comes with repellent mats with the active ingredient allethrin which is a synthetic version of botanical insecticide pyrethrum. The compound is commonly used in household products for mosquito control and has low toxicity for humans. This device is has a larger coverage and stronger effect than Off! repeller covering as much as 15 square feet of the area. Therefore, this item is not just a way to ensure personal protection but is also intended to create a mosquito-free space in the place where it is installed. The product comes with 3 repellent mats that will release the allethrin over the course of 12 hours. Once run out of the insecticide, just change the mat. Apart from the product’s evident effectiveness, I like its color score — a camouflage-style design. Another model is Thermacell Radius Zone Mosquito Repellent which is a longer lasting solution of this brand. The product ensures protection for as much as 40 hours after it was turned on. Especially noteworthy is the fact that the device operates on a single refill which has to be purchased separately though. What the pack includes in a standard 12-hour refill. The manufacturer claims that the product effectiveness is due to the repellent formulation that includes pyrethroid. This innovative model is twice the price of the previous product and will cost you some $50. Apart from being a long-lasting solution, it is considerably more powerful. Let’s compare: while MR-150 model covers an area of 15 square feet, this one can protect as much as 110 square feet. A considerable difference, is not it? On top of that, the unit is portable, battery-powered and is about three inches in size. So feel free to take it with you on a trip. And here is one more solution by Thermacell that lasts even longer but is cheaper than Radius Zone Repellent. How come? MR-BPR Backpacker Mosquito Repeller With this item, you get 90 hours of protection and a 15×15 square feet of a mosquito-free area. This product is more lightweight and even more compact. However, its main difference is in the gas being a source of power. Its gas canister produces heat directed to a repellent mat filled with allethrin. This explains why MR-150 and MR-BPR have the same coverage area, while the duration of the insecticide effect is due to its fuel source. As a reference, gas canister does not come with the product, so it will cost you more than the price of the item. You may try OFF! 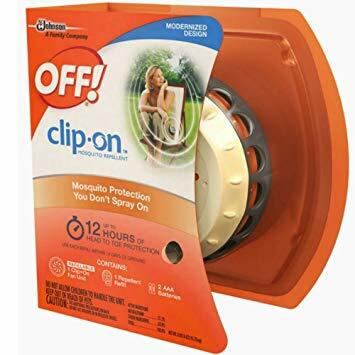 Clip On Mosquito Repellent. As its name suggests, the model is designed to be attached to your belt, bag or other items of clothing. Just clip it on and forget. The product comes with repellent discs, with each refill being effective within two weeks after it was opened. Extra refills are produced by the company as well and need to be purchased separately. How does it work? The device releases a repellent with the active ingredient metofluthrin which is a pyrethroid proved to be able to effectively ward off as much as over 90% of mosquitoes, according to scientific studies. Then, an in-built fan circulates the repellent all around you, working quite and protecting you from the head to toe. There is such beneficial feature as a LED light indicator that will make you aware when the battery is running out and three hours before the refill ends. As a reference, one disk ensures 12-hour protection from mosquitoes. When using the device, you should remember that you have to remain in place for several minutes so that protection can be built up around you. The punch line here is that the device emits high-frequency sounds that are inaudible to human ears because they are too high. Meanwhile, this frequency is said to be the right one to drive mosquitoes away. And there are several reasons for that. First, ultrasonic noise imitates wing beats of males mosquitoes, something that the females tend to avoid after mating. Secondly, bats, dragonflies and some other predators that feed on mosquitoes emit high-frequency sounds, which is believed to frighten them off as well. Look at this model of a portable ultrasonic repeller by Soaring. Its range amounts to 107 square feet with a two-meter diameter. This item would be the best option for outdoor adventures as it is almost weightless — just one ounce and a half — and can be kept in a pocket or carried with the strap. Two different modes can be set — one warding off mosquitoes (22-28 kHz) and another targeting dragonflies (35 kHz). As for the latter, I do not believe it to be something really necessary but rather a sort of an unnecessary gimmick. The device operates on AAA batteries, which need to be purchased separately though. Since the item is supposed to be used during hiking and other similar activities, its emergency alarm will surely come in handy. The alarm emits the sound that has 90 dB level, which approximately the same as that from an operating chain-saw. However, this will not pose a risk for your ear, unless the exposure is too long. Another beneficial feature is LED flashlight that can help you out at night time. Sounds tempting as we have already get used that nowadays, smartphones are more than just the means of communication. So why not to transfer the responsibility for deterring mosquitoes to them? There are mosquito-repelling apps available for both Android and iOS. The Independent mentions “dozens of apps” that are designed to ward off these pests. They work by making your phone emit a high-frequency sound to keep off biting females. Although there are studies proving that mosquitoes respond to wing beat frequency, mosquito-repelling apps have not been scientifically examined yet. That said, I would like to point out the fact that while being an unproven method to deter these insects, mobile apps are still worth considering. Sure, you should not rely on them in the hope to avoid bites. But why not to give them a try, given that the only thing you need to do is download the app? Electronic mosquito repeller releasing insecticide No need to bother with spraying and fogging. Works automatically, what you need is to turn on the device. Unlike DEET, does not require applying harmful chemicals to the skin. Mobile mosquito repellent app You are missing nothing. So why not to give it a try? As I have already mentioned before, the main trouble with these devices is their efficacy. Now, manufacturers have to substantiate their claims by scientific findings and this is obviously something they lack for today. Experts at The University of Arizona refer to a study where devices producing a wide range of ultrasonic sounds had been tested. Two species of mosquitoes were used in the study but none of them responded to ultrasound. However, the experts assume that ultrasound that starts at 18,000 Hz is capable to disrupt the normal communication of pests, causing confusion. Why ultrasound? As scientists have discovered, male and female mosquitoes respond to the frequencies produced during their flight. Moreover, they can change the frequency of wing beats responding to a potential partner. This unusual form of communication allows the female to detect the male that will be compatible for mating, based on sounds it emits. This knowledge has led to the idea, advertised by ultrasonic repeller manufacturers, that females that have already mated with their partners will avoid the source of ultrasound since it is associated with males. While these ladies are preoccupied with finding the place to lay eggs and will be frightened off by the perspective to mate once again. And these are females mosquitoes that bite us, which happens because they need blood for reproduction. Another source of ultrasound is mosquito predators, such as bats that emit the sound of up to 60 kHz. A scientific study has shown that this frequency band did not have a considerable impact on mosquitoes, however, half of the tested insects stayed immobile when subjected to 30-60 kHz frequency range. Specialists at the University of California described the results of a comparative analysis of electronic and chemical repellents, testing several species of insects including mosquitoes. The research has shown that mosquitoes were reduced by 32% by means of sound and 77% in the areas treated with permethrin. The study obviously speaks in favour of using insecticides but we can also conclude that exposure to ultrasound can affect these insects to a certain extent. What Alternative Methods Can Be Used In Mosquito Control? No matter to what extend ultrasonic repellers can be effective, they are recommended to be used as part of a comprehensive treatment. So what methods are there? Sprays. Treating your garden with insecticides. Chemicals are your heavy artillery. And if the infestation is severe, you have no chances to get alone using less powerful devices, even those releasing insecticides. Use cypermethrin and bifenthrin to treat places where mosquitoes hide during the day. Such places as shrubs and along the doorway should be treated with the use of a sprayer. Foggers. Use them to target flying insects at dusk, applying pyrethrin and resmethrin. They have a short-term effect but are recommended for creating a mosquito-free area before an outdoor event. The peculiarity of this method is that foggers convert insecticidal liquids into tiniest particles that can reach the larger number of insects. CO2 Traps. There is a variety of such devices that differ mainly in the way they attract mosquitoes. Some lure the pests in a trap by means of heat, others utilize CO2 or water. However, the most effective traps use a combination of these attractants. When the insect gets into a specially designed container, it gets trapped and dies from dehydration. Electronic rackets. Bug zappers are generally considered to be less effective, which is because they are not good at attracting target pests. That is why a bug zapper racket has become that popular: they have a dual mode of action and can be used both as a zapper and as a swatter with an electronic grid. DEET-based solutions for personal protection. DEET is the oldest and the most common ingredient included in the formulation of lotions and sprays intended to be applied directly to the skin. That said, DEET is known to be able to damage plastic surfaces and tissues as well as it can harm your pets. Ultrasonic devices are absolutely safe to humans. Once turned on, they work automatically. You do not have to remove dead insects as it is the case with traps. No need to take special precautionary measures. For example, after spraying insecticides, you should not allow your family members and pets to enter the area. Or when fogging, you need to avoid plants hosting beneficial insects. Most devices are portable and lightweight and can be easily taken on a trip. Ultrasonic repellers are recommended for using indoors. Efficacy of ultrasonic devices has not yet been scientifically proven to work against mosquitoes. Conventional methods of insecticidal treatment remain the only ones that ensure effective protection. Electronic repellers releasing chemicals cannot be used indoors. What is the best electronic mosquito repeller? If you do not mind using chemicals, try Thermacell. The products under this brand have been successfully used even by the US Army in Afghanistan. Of course not. Worse still, there is no scientific evidence that ultrasound can repel them. What frequency is best to repel mosquitoes? Again, there is no scientifically proven data about what frequency has an impact on mosquitoes. However, there are studies showing that these pests can respond to a frequency range between 35 and 60 kHz. Can I use an electronic mosquito repeller in my bedroom? As for devices that release insecticides, no, you should not. Ultrasonic repellers, to the contrary, are perfect for use inside the house and the bedroom in particular. Good protection for a quiet sleep. Are these devices safe for pets? Ultrasonic repellers are absolutely safe and will not disturb any cat or dog.